What is a Digital Game? Before making an argument for digital game-based learning, it is imperative to define a digital game. In my paper, I define a digital game as any game on a console, handheld device, smartphone, or computer, including browser games. It includes different genres and types, including simulation, augmented reality, and alternate reality games. Simulations and games can often blur in definition. Games tend to have a set of rules and a clear objective, whereas simulations “are generally defined as representing one symbol system through another” (Squire and Patterson 2010). For example, a pilot trainee might use a simulation to experience flying a helicopter, while a player in SimCopter will also fly a helicopter but will rescue or transport people to accrue money or points. Augmented reality (AR) is a “simulation that combines real surroundings with virtual simulated information to convey authenticity in large scale scientific investigations (Klopfer 2005). An alternate reality game (ARG) is defined as a “game you play in real life and not in a virtual environment by using real life as a platform and uses transmedia to deliver the story” (McGonigal 2011). For example, Chore Wars turns household work into a quest where players earn virtual gold for completing different “missions” like cleaning the bathroom or taking out the trash. James Paul Gee, the Mary Lou Fulton Presidential Professor of Literacy Studies at Arizona State University, describes a game as two pieces (see video below). There is the actual game but also “the whole social system of interactions the players engage in inside (for multiplayer games) and around the game (sometimes called the meta-game)” (Gee 2011). Gee explains this meta-game may be where the actual learning occurs as players share strategies, ask and answer questions, build “mods” (modifications for the game’s design or graphics), research game algorithms, and create communities. Games often have a negative stigma attached to them and classified as a violent and mindless activity. Parents may see them as a waste of time, and teachers might see them as competitors for students’ time; however, the statistics around gameplay are actually quite surprising. Many assume the typical gamer is a young teenage male that is furiously mashing buttons during a Mortal Kombat match. In fact, 47% of game players are female and the typical game player is 30 years old (ESA 2012). Researchers have found no evidence that frequent gameplay leads to social isolation, and “60 percent of frequent gamers play with friends” while “33 percent play with siblings and 25 percent play with spouses or parents” (Salen 2008). Motion-based games with multi-player emphasis, like Zumba Fitness and Just Dance 3, were two of the top 12 video games for 2011 (ESA 2012). Games can also be rich with learning and social activity. Top selling games like Mario Party, Brain Age and Wii Sports on the Nintendo’s Wii emphasize social play. Sid Meier’s Civilization is strategic and packed with history, challenging players to take on the role of Gandhi of India or Catherine of Russia and build their civilization. Civilization players must expand cities, manage trade relations, address food shortages, advance technology, and find resources to make sure their civilization survives the test of time. The Sims allows players to experience the constraints of a family budget and the difficulties of balancing a job, social life, and hobbies. Roller Coaster Tycoon, a construction and management game, challenges players to design roller coasters under the constraints of physics. Using games to educate and train is not a new concept. Games have been used in everything from military and employee training to customer engagement (Hays 2005, Fowler 1994). It, therefore, is a bit counter-intuitive that games are considered effective in teaching strategy to firefighters or simulating surgery for physicians, but they are not used in the classroom where they could have the greatest impact. 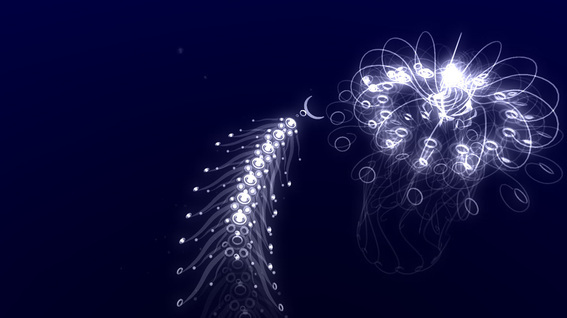 Below: The indie game, Flow, by Thatgamecompany. In Flow, the player navigates a aquatic microorganism that evolves by consuming other microorganisms. Educational games became popular in the 80’s with the growing number of personal computers and the approval of parents. As competition grew, “big box stores required publishers to offer products at lower prices, and for lower profit margins” while publishers simultaneously had to distinguish their products by “licensing characters with built-in market appeal (Rug Rats, Sponge Bob, etc.) that would stand out on the shelf” (Klopfer et al. 2009). Meanwhile, the surge in technology led to high quality entertainment games that made low budget educational games pale in comparison, and it was not long before the educational game industry collapsed. This memory of failure continues to linger, and “few companies are willing to make the investments needed to develop such games since there is yet no demonstrated market” (Federation of American Scientists 2006). However, games are now being revisited as educational tools by several leading organizations, such as MIT’s Education Arcade and Games-to-Learn project, Woodrow Wilson Foundations’ Serious Games Initiative, University of Wisconsin’s Games, the Federation of American Scientists, the Bill and Melinda Gates Foundation, and the U.S. Department of Education.Next, we will talk about why these games are being revisited and the benefits that many are starting to see.